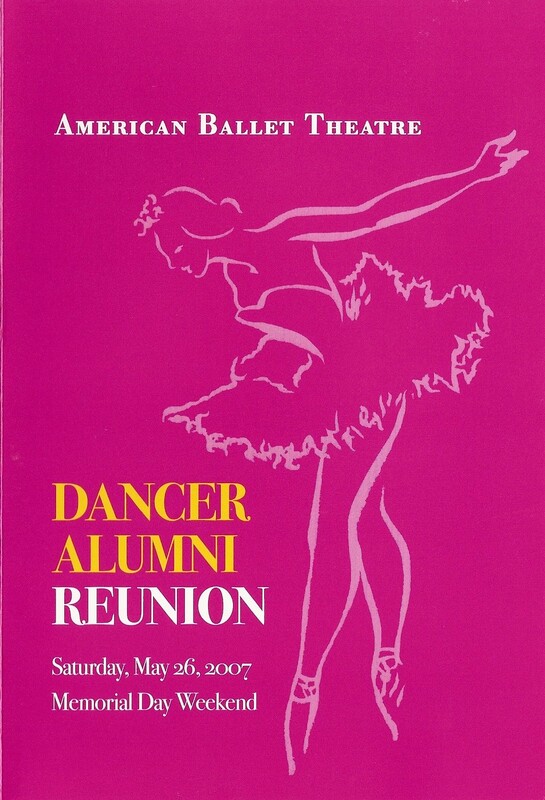 I often reflect fondly on my year at American Ballet Theatre, planning their 2007 dancer reunion. I jumped at the chance… after all, what ballet aficionado would pass up the opportunity to work at the ABT offices in NYC, not to mention connect with every dancer they’ve ever adored in their life? What an opportunity I was given! The Saturday of Memorial Day weekend became the target date for a 650+ reunion of American Ballet Theatre dancers. 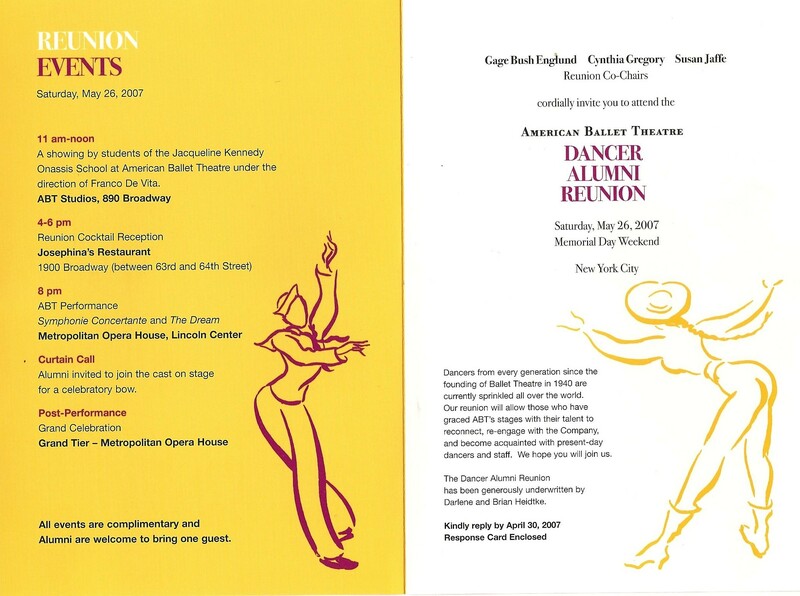 What we wound up with was a daylong event hosted by Gage Englund and ballet luminaries Susan Jaffe and Cynthia Gregory which included a morning JKO School demonstration, an evening cocktail reception and an invitation to an ABT performance at the Metropolitan Opera House that night. All would be followed by an alumni curtain call bow and after-party on the Met’s Grand Tier. Wow. ABT’s offices and studios are not glamorous in the least. When you enter 890 Broadway you are met by two pint size elevators in the small lobby, operated by elevator men using hand levers and pull grates. After being dropped on ABT’s 3rd and main floor, you find a gray reception area with exposed ceiling pipes, a no frills space indeed. The administrative and artistic offices are on this floor, along with one ballet studio. Two staircases lead from the third to the second floor, which contains additional studio space, as simple as the floor above. But oh, the beauty that comes from this unassuming space! One morning I walked past the 3rd floor studio and couldn’t help but stop and watch some of company class from the door. The class, often taught by ballet veteran and company teacher Lupe Serrano, was a joy to watch. What could be better than standing steps away from someone like Paloma Herrera, with those incredible arched feet, always in the same place at the barre, quietly observing her tendu combinations? Another day walking past the same studio I noticed a different person teaching company class. She was striking and dramatic, with a body to die for. She looked so perfect in her leggings and leotard, her head topped by a long scarf, tied bandana style with ends draping long down her strong back. I wasn’t sure who this woman was, demonstrating a magnificent grand battement with perfect extension. I asked. It was prima ballerina Natalia Makarova. She was 67 at the time. Sometimes I would pass the studio at lunch time, and the Corps would be sprawled out, sitting on the floor chomping on sandwiches, these little girls no older than my own daughters who on stage look so ethereal, so mature, so adult. They seemed so young, and who said dancers don’t eat! And what could be better than watching the rehearsal of La Bayadère from the studio door – principal conductor Charles Barker sitting on the piano bench next to the wonderful Gladys Celeste, ABT’s pianist who passed away little more than a year later. There he sat, conducting the music with pencil in hand, while Gladys played the famous score by Ludwig Minkus. I watched the ballerinas enter in crisscross, wearing leotards and warm ups, leggings and sweatshirts, stepping in to that beautiful music of the “Shades” scene. Despite the studio setting and bright lights and exercise clothes, it was so overwhelming and amazing to watch, I started to cry. ← BEER, NACHOS AND BALLET The Royal Ballet at the O2 Arena – Good or Bad? Thank you for including me on your blog list. You have a terrific site – good luck with your book!